The city’s climate is temperate humid with summer rains. Spring is the driest season and warm with winds in February and March rainfall is between May and October, presenting intense electrical storms and high winds. In summer and very warm spring day with highs above 33 ° C are numerous, recording warm days even in January and February. Towards autumn and winter rainfall decrease and give way to sunny days and cold north winds. In winter it is common for occasional frosts occur with temperatures down to -6 ° C during the coldest nights, usually during the months of January and February. The northern climate is less warm and colder and less rain. What is Guadalajara weather like in January? What is Guadalajara weather like in February? What is Guadalajara weather like in March? What is Guadalajara weather like in April? What is Guadalajara weather like in May? 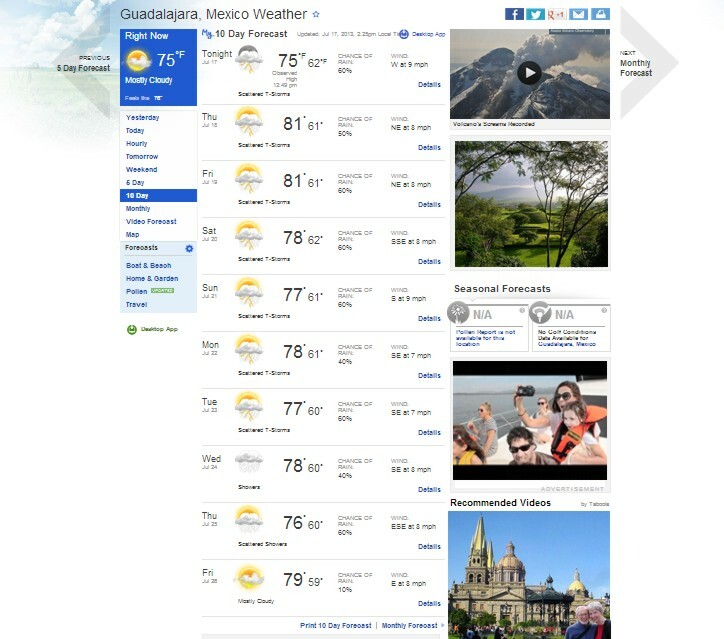 What is Guadalajara weather like in June? What is Guadalajara weather like in July? What is Guadalajara weather like in August? What is Guadalajara weather like in September? What is Guadalajara weather like in October? What is Guadalajara weather like in November? What is Guadalajara weather like in December?